CHECK YOURSELF - Sugar, Darling? Guys I don't think a dress has made me feel as cute as this one in a long long time! I feel like this is one of those styles that looks better on a fat body than a thin one, especially if you have a bigger bum and tum and smaller bust like moi. 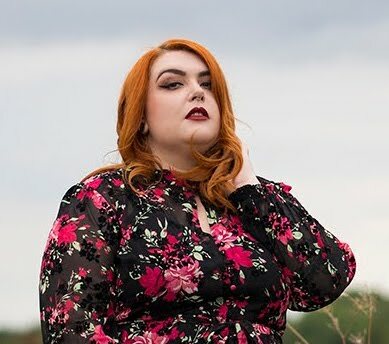 This is the Check Dress by Unique 21 Hero (£38.00*), the new plus size line from Unique 21 that goes up to size 26 which is the size I'm wearing here and was perfect for me. It doesn't have stretch and I did add a few stitches to hold it closed over my bust so if your chest is bigger than mine then you'll want to size up. The fabric is lovely and soft and pretty thick so it's really warm and the weight of the fabric helps emphasise the clever way that it's cut to give a flare to the skirt. I've legit worn this baby at least six times since I got it a few weeks ago and it's become one of my faves of this season, I'm pretty sure I'm actually going to wear it on Christmas Day when we go for a meal with Pete's family as it feels adorably festive! In my next post I'll be wearing more Unique 21 Hero and I have to say I'm really impressed with their pieces. The quality of everything I've tried has been fantastic and I've seen lots of my fellow blogger babes in their gear too all looking stunning. Definitely a brand to watch!